New Children’s Tale, "Quack-A-Nack," Asks How Come This Duck Can’t Quack? 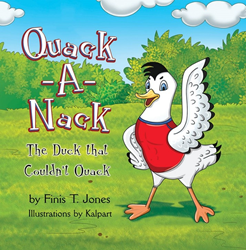 Imaginative new book from Finis T. Jones finds exactly what happens when a young duck is accidentally raised by a Mother Hen! "Quack-A-Nack: The Duck that Couldn’t Quack" is one lucky duck! Accidentally raised by Mother Hen instead of Mother Duck, the duck later discovers he has two mothers! In the excitement leading up to the duck Olympic swimming tryouts, Mother Duck accidentally lays her egg named Quack-A-Nack in Mother Hen’s nest. When Mother Hen finds the egg and it hatches, she knows this little guy is very special. Raised by a chicken instead of a duck, Quack-A-Nack never learned to quack. When he finally meets his “real” mother, he says he’s so lucky to have two mothers who love him that he will forever love them both, uniting the chicken and duck families forever. “This delightful children’s story points out the differences between us can always be conquered by love. We are intensely pleased to announce its release,” said Robert Fletcher, CEO of Strategic Book Publishing and Rights Agency. http://sbprabooks.com/FinisTJones or at Amazon.com or Barnesandnoble.com.